What are Ibsen surface relief, fused silica transmission gratings? We pattern our gratings by 2-beam interferometry (also known as holographically) or lithographically, initially into photoresist, which is then used as an etch mask to transfer the grating pattern into the fused silica by Reactive Ion Etching (RIE). Every grating is thus a high fidelity, high integrity master, not a replica. How do I calculate the diffraction angles of a grating? 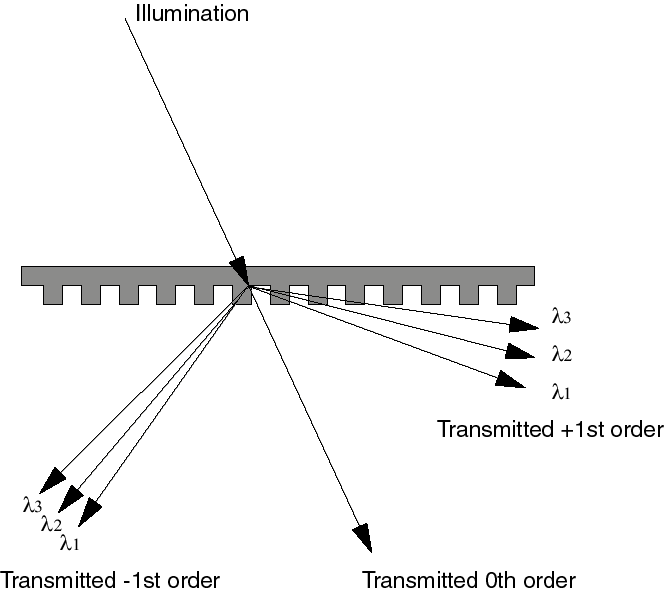 What are the main differences between reflection gratings and transmission gratings? What are the main differences between fused silica transmission gratings and Volume Phase Holographic (VPH) gratings? Surface relief, fused silica transmission gratings are monolithically integrated into the fused silica substrate surface, and thermally and environmentally just as stable as the blank fused silica substrate. VPH gratings are recorded into a gelatin material, sandwiched between 2 substrates with the edges sealed, as the gelatin material is environmentally instable. The temperature handling capability of gelatin-based VPH gratings is little more than 100 degrees C, while fused silica transmission gratings can withstand over 1000 degrees C.
The diffraction efficiency of surface relief gratings is 3 times less sensitive to angle of incidence variation than thick VPH gratings. This is fundamental (can be derived from Kogelnik’s original grating analysis work), and related to the refractive index modulation of the gratings – see for example “Dielectric surface-relief gratings with high diffraction efficiency” by Kiyoshi Yokomori, Applied Optics / Vol. 23, No. 14 / 15 July 1984 (http://www.opticsinfobase.org/ao/abstract.cfm?uri=ao-23-14-2303). How efficient can fused silica transmission gratings be? For a narrow bandwidth, fused silica transmission gratings can be designed to theoretically have over 99% efficiency, for a single (TE-(s) or TM(p)) polarization, or even for both polarizations simultaneously. For more broad bandwidths there is a tradeoff between the spectral width and both the average and peak efficiency that can be achieved. For grating with bandwidths of an octave ( i.e. where the end wavelength is double the start wavelength) or more, fused silica transmission gratings can typically have 75% average efficiency. Narrowband gratings (up to half an octave) can typically have 90% average efficiency or more. How can fused silica transmission gratings be cleaned? While the micro-structured grating surface should not be physically touched, the fused silica-based grating structure can handle most chemical cleaning. Bath-based cleaning processes can be established for a simple acetone – IPA – DI water clean, but the gratings can also handle detergent, moderate ultrasound, acid or alkaline chemicals. For periodic cleaning requirements in the laboratory. We recommend the commercial cleaning solution called “First Contact”. This cleaning product is effective for many optics cleaning requirements. For further information on First Contact, please see the manufacturer’s web-site: http://photoniccleaning.com. Are fused silica transmission gratings easy to align? What wavelengths can fused silica transmission gratings be used for? We make gratings for the entire transmission range of fused silica, which starts below 200 nm and goes beyond 2000 nm. The plot below show the UV applicability of UV grade fused silica material (and thus UV fused silica transmission gratings) – here shown as the external transmission (i.e. there is approx. 8% surface Fresnel reflection loss) of a 6.35 mm thick substrate. What are the power and energy handling capabilities of fused silica transmission gratings? Fused silica transmission gratings can handle just as much power and energy as blank fused silica substrates. Quantitative values depend on wavelength and pulse length. For CW illumination our gratings have been used at more than 400 kW/cm2, while with fs lasers our gratings have been used at more than 20 TW/cm2. For more information, see http://www.ibsenphotonics.com/products/transmission-gratings/high-power-gratings. What size gratings do you make? We have holographic stepper and lithography based production equipment for cost-effective, high volume production of gratings with sizes up to approx. 25 mm x 20 mm, and we have flexible, low volume holographic production equipment for gratings up to 120 mm size. What temperatures can fused silica transmission gratings handle? Fused silica transmission gratings can handle over 1000 degrees C. The CTE of fused silica is very low (0.5×10-6/°C) so the grating period is very insensitive to temperature change. Furthermore, as the change of the refractive index of fused silica with temperature also is very low (1.28×10−5/°C at 20 degrees C), the diffraction efficiency variation with respect to temperature is also negligible. Where can I read more about your gratings? We provide an online grating equation calculator. Click here.